On Sunday evening, my eyes were glued to eight windows on my computer screen, watching data pop up every few seconds. NASA’s Cassini spacecraft was making its lowest swing through the atmosphere of Saturn’s moon Titan and I was on the edge of my seat. Trina Ray, a Titan orbiter science team co-chair, was keeping me company. Five other members of my team were also at JPL. Between us, we were keeping an eye on about 2,000 data channels. It was a nervous time for me — the previous night we had been at JPL to send some other real-time commands to the spacecraft when an alarm came in indicating that the magnetometer, the prime instrument taking data for the T70 flyby, needed a reset. Fortunately, the controller on duty immediately called the magnetometer instrument operations team lead in England. Within 90 minutes, the commands were on their way to do a computer reset and clear the alarm. At 2 a.m. Pacific time on Sunday, we got the email indicating all was well and the magnetometer was ready for the Titan closest approach. So here we were, past one hurdle, hoping nothing else would come up. We had run hundreds of simulations over the past three-and-a-half years, so I knew we had done everything we could think to do. We did more training for this event than anything else we had done since we dropped off the Huygens probe in January 2005 for a descent through the moon’s hazy atmosphere. Right on time, at 7:26 p.m., the Deep Space Network locked on the spacecraft downlink, a good start. I was focused on the data for spacecraft pointing. As long as we stayed within an eighth of a degree of the expected pointing, everything would be fine. At 7:45 p.m., we got the data from closest approach, a mere 880 kilometers (547 miles) in altitude. Over the vocabox, a cross between a telephone and walkie-talkie, the attitude control team reported that the thrusters were firing about twice as much as we expected. The Titan atmosphere appeared to be a little thicker than we expected, even though we had fed about 40 previous low Titan flybys by Cassini and the descent data from Huygens into our modeling. But spacecraft control was right on the money, keeping the pointing within our predicted limits. Even with the extra thrusting, we stayed well within our safety margin. At 7:53 p.m., the spacecraft turned away to go to the next observation. I let out a sigh of relief, happy that everything during closest approach had gone just as we planned. Five attitude control guys crowded into my office with smiles on their faces. Trina and I were marveling at what a wonderful spacecraft we have to work with. Another first for the Cassini mission! Now, as Trina says, we have to finish the job by returning all the great science data. We have data playbacks today at two different Deep Space Network stations to make sure we have – as we say here – both belts and suspenders. Engineers will also go back to analyze the data with the scientists to see just how dense the Titan atmosphere turned out to be at our flyby altitude. But last night, at least, my team and I went home happy! Julie Webster, spacecraft operations team manager for NASA’s Cassini spacecraft, oversees the engineering subsystems and overall spacecraft health and safety. She is a systems engineer at JPL. This weekend, Cassini will embark on an exciting mission: trying to establish if Titan, Saturn’slargest moon, possesses a magnetic field of its own. This is important for understanding the moon’sinterior and geochemical evolution. For Titan scientists, this is one of the most anticipatedflybys of the whole mission. We want to get as close to the surface with our magnetometer as possible fora one-of-a-kind scan of the moon. Magnetometer team scientists (including me) have a reputation forpushing the lower limits. In a world of infinite possibilities, we would have liked many flybys at 800kilometers. But we went back and forth a lot with the engineers, who have to ensure the safety of thespacecraft and fuel reserves. We agreed on one flyby at 880 kilometers (547 miles) and both sides werehappy. Flying at this low altitude will mark the firsttime Cassini will be below the moon’s ionosphere, a shell of electrons and other charged particles thatmake up the upper part of the atmosphere. As a result, the spacecraft will find itself in a region almostentirely shielded from Saturn’s magnetic field and will be able to detect any magnetic signatureoriginating from within Titan. Titan orbits within the confines of the magnetic bubble aroundSaturn and is permanently exposed to the planet’s magnetic disturbances. Previous measurements by NASA’sVoyager spacecraft and Cassini at altitudes above 950 kilometers (590 miles) have shown that Titan doesnot possess an appreciable magnetic field capable of counterbalancing Saturn’s. However, this does notimply that Titan’s field is zero. We’d like to know what the internal field might be, no matter howsmall. The internal structure of Titan can be probed remotely from its gravitational field or itsmagnetic properties. Planets with a magnetic field — like Titan’s parent Saturn or our Earth — arebelieved to generate their global-scale magnetic fields from a mechanism called a dynamo. Dynamo magneticfields are generated from currents in a molten core where charge-conducting materials such as metals areflowing around each other and also undergoing other stresses because of the planet’s rotation. a) Titan’s interior still bears enough energy to sustain adynamo. b) Titan’s interior is “cold” (and therefore has no dynamo), but its crust is magnetized in asimilar way as Mars’ crust. If this is the case, we should find out how this magnetization tookplace. c) Something under the surface of Titan got charged temporarily by Saturn’s magnetic fieldbefore this Cassini flyby. While I said earlier that the ionosphere shields the Titan atmosphere fromSaturn’s magnetic bubble, the ionosphere is only an active shield when the moon is exposed to sunlight.During part of its orbit around the planet, Titan is in the dark and magnetic field lines from Saturn canreach the Titan surface. A temporary magnetic field can be created if there is a conducting layer, likean ocean, on or below the moon’s crust. 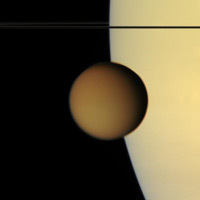 Once Cassini leaves Titan, the spacecraft will perform aseries of rolls to fine-calibrate its magnetometer in order to assess T70 measurements with the highestprecision. We’re looking forward to poring through the data coming down, especially after all thenegotiations we had to make for them! César Bertucci, a space physicist working at the Instituto de Astronomía y Física del Espacio inBuenos Aires, Argentina, is a Titan expert on the Cassini magnetometer team. He is also a specialist inthe solar wind interaction with weakly magnetized bodies such as Mars, Venus and comets.